Historic Downtown Hendersonville – was entered into the National Register of Historic Places in March of 1988. The serpentine street features planter boxes brimming with, benches, seasonal flowers and trees. 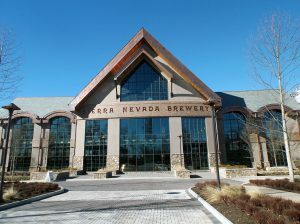 Downtown boasts a wide array of shopping, antique stores, galleries, museums, an aquarium and a variety of restaurants. Downtown offers free Wi-Fi for everyone to enjoy. Click to take a virtual tour of Downtown Hendersonville. 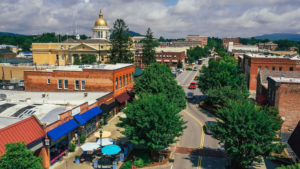 Downtown hosts many activities including the NC Apple Festival held during Labor Day weekend, as well as, art shows, an antique show, car shows, and parades throughout the year. For additional information call the Main Street Program (828) 233-3216. 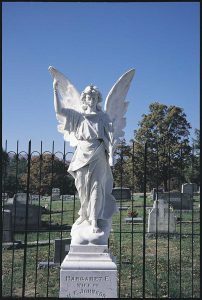 Wolfe’s Angel – Author Thomas Wolfe’s first novel was “Look Homeward, Angel”. In the book there are constant references to an angel statue carved from Italian marble. This is the angel Wolfe placed in American literature. Thomas Wolfe’s father, W.O. Wolfe, sold the statue to the Johnson family to mark the family plot in Oakdale Cemetery. The angel is holding a lily in her left hand and extending her right hand upward. Oakdale Cemetery is located on Hwy. 64 W., just a short distance from downtown. The statue is protected by a wrought iron fence, and there is a historical marker located on the highway. Western North Carolina Air Museum – is the first air museum in the state of North Carolina known as the “first in flight” state. 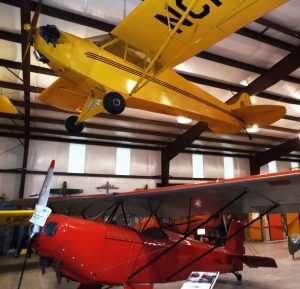 The museum features award winning restored and replica antique and vintage airplanes. Open (weather permitting) April-October Wednesday and Sunday from 12Noon-5pm, Saturday 10am-5pm; November-March Wednesday, Saturday and Sunday from 12Noon-5pm. No admission charge. The museum is located adjacent to the Hendersonville Airport, 1340 East Gilbert Street, Hendersonville, NC (828) 698-2482. Henderson County Heritage Museum – The Henderson County Heritage Museum brings history with public display galleries, artifacts, collections, archives, libraries, demonstrations, performances and other similar exhibitions relating to the history, culture, and heritage of Henderson County. The museum is housed in six rooms of the renovated Historic Henderson County Courthouse. The museum hours are Wednesday – Saturday from 10am – 5pm and Sunday 1pm-5pm. For information call (828) 694-1619. Apple Valley Model Railroad Museum– The first steam engine puffed up the Saluda Grade to the Hendersonville Depot in 1879. The steam engine needed a “help engine” attached to the rear of the train at Melrose for additional power to push the train up the Saluda Mountain Grade, the steepest main-line standard gauge railroad in the United States. The Carolina Special ran between Charleston, South Carolina and Cincinnati, Ohio from 1911 until 1968. Mineral & Lapidary Museum of Henderson County – The Mineral & Lapidary Museum of Henderson County was established in 1997, housing exhibits from North Carolina, minerals, Indian artifacts, a dinosaur egg nest, fossils, fluorescent minerals, gems and faceted minerals. The Museum’s specialty are Geodes, which are sold, cracked and/or displayed, plus a large skeletal replica of a T-Rex Dinosaur Head. Admission is free. The museum is located at 400 North Main Street, on the lower level of the Henderson County Genealogical & Historical Society building. For information call (828) 698-1977. Historic Johnson Farm – Johnson Farm is a fine example of a late 19th and early 20th century farm & tourist retreat. The entire structure was handmade from bricks that were fired on site from French Broad River mud. The Johnson Farm was the home of a wealthy tobacco farmer, Oliver Moss. Construction of the elegant home, smokehouse, and granary began in 1876 and was completed in 1880. Over the years many outbuildings were constructed, including a tool shed/blacksmith shop, barn, boarding house, and a cottage. In 1987 the Johnson brothers willed their farm and personal possessions to the Henderson County Board of Public Education. It was Vernon and Leander’s wish that the property become a hands-on museum, a lasting example of a typical mountain farm through which students could explore their heritage. The farm was listed on the National Register of Historic Places in 1987. The Heritage Weavers and Fiber Artists have transformed the boarding house into a fiber arts center, which includes weaving, rug hooking, bobbin lace, spinning, or knitting. The farm is located at 3346 Haywood Road, across from Rugby Middle School. For information call (828) 891-6585. Admission charged. 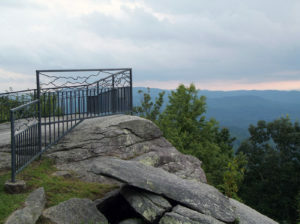 Jump Off Rock – Jump Off Rock is a scenic overlook, which provides a panoramic view of rolling pastures, the Blue Ridge and Pisgah mountain ranges. Jump Off Rock also holds an Indian legend that has been passed down for many, many years. Over 300 years ago a young Cherokee Indian maiden received word that her young Indian Chief had been killed in battle, so she climbed to the edge of the rock and jumped off. Indian legend has it that on moonlit nights you can see the ghost of the maiden on Jump Off Rock. Jump Off is located about 5 miles from downtown at the end of Laurel Park Hwy. The park is open daily, sunrise to sunset. No admission charge. Holmes Educational State Forest – Holmes Educational State Forest offers a series of well-marked trails, accented by exhibits and displays depicting ecology of a managed forest. Picnic sites with tables and a spacious picnic shelter & grills. Holmes Educational State Forest is located about 8 1/2 miles from downtown. The forest is open Tuesday-Sunday from mid-March to late November. For information call (828) 692-0100. 1299 Crab Creek Road, Hendersonville. DuPont State Recreational Forest – The forested land was purchased by the State of North Carolina, after DuPont sold its industrial operation in 1996 and 1997; the surrounding land holdings became DuPont State Forest. The forest encompasses 10,268 acres in Henderson and Transylvania counties. 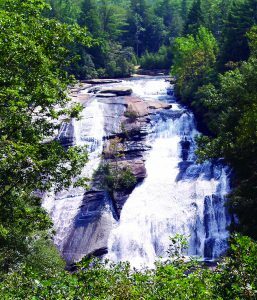 It is situated in the Little River valley and includes waterfalls and 80 miles of roads and trails wandering through mountainous terrain. It is open to the public for hiking, mountain biking, and horseback riding. Fishing is allowed with a valid NC fishing license. Hunting is by special permit only, issued by NC Wildlife Resources Commission. The North Carolina Division of Forest Resources manages the forest. For information call (828) 877-6527. Many scenes from the movie, The Hunger Games, were shot in Dupont State Recreational Forest. The Hunger Games were filmed entirely in North Carolina. The Hunger Games trilogy, which includes Catching Fire and Mockingjay, is a young-adult adventure science fiction series written by Suzanne Collins. The entire district of Flat Rock is included in the National Register of Historic Places. Historic Flat Rock Incorporated is striving to preserve the feeling of the Old South. Historic Flat Rock is home to several attractions such as: The Flat Rock Playhouse, State Theatre of NC; the Carl Sandburg Home, NHS; and St. John in the Wilderness Episcopal Church as well as many unique specialty shops and enterprises. Flat Rock Playhouse, State Theatre of North Carolina -produces a variety of comedies, musicals, farces, and dramas, which range from World Premieres to the latest from Broadway and London to the Classics. 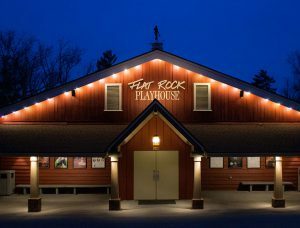 The Flat Rock Playhouse has presented hundreds of productions for over sixty years. 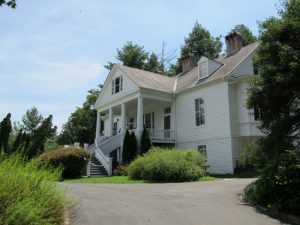 Carl Sandburg Home National Historic Site – Carl Sandburg, American poet, historian, author, and lecturer spent the final 22 years of his long and productive life at his estate, Connemara, in Flat Rock, NC. Today this National Historic Site offers a keen insight on Mr. Sandburg, his family and their 264 acre working farm. 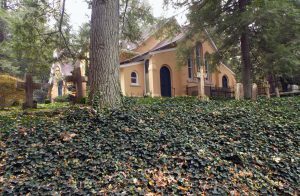 The Sandburg Home was built in 1838 and now houses his collection of 10,000 books, notes and papers. The home offers daily tours and is closed only on Christmas Day. There are numerous hiking trails and a functional goat barn, where Mrs. Sandburg raised her prize winning goats. For additional information call (828) 693-4178, 81 Carl Sandburg Lane, Flat Rock, NC. Admission charged for home tour, access to grounds is free). St. John in the Wilderness Church – St. John in the Wilderness Episcopal Church, listed on the National Register of Historic Sites, offers a unique perspective of prominent families in southern and national history. St. John in the Wilderness was built as a private chapel in 1833, on the grounds of Charles and Susan Barings’ home, Mountain Lodge. The church was deeded to the Episcopal Diocese of Western North Carolina in 1936. Many well-known members of southern aristocracy have family plots in the churchyard; those names include: Christopher Memminger, first secretary of the Confederate treasury; Rev. John Drayton,developer of the world-famous Magnolia Gardens of Charleston; members of the families of three signers of the Declaration of Independence; Major General Edward P. King, Jr., of the United States Army who led the defense of the Bataan Peninsula in the Battle of Bataan against the Japanese invasion of the Philippines in World War II. The church and graveyard are open Tues. – Sun. from 9:00AM-4:00PM for visitation. The church is located at 1895 Greenville Hwy. in Flat Rock. For information call (828) 693-9783.